A documentary which comes as part of this issue explains the raison d’être behind the project. It was designed not just as a performance of Holst’s suite but as an interactive experience at the London Science Museum where participants could act as conductor, player or even composer as part of an educative project. Obviously with a DVD issue the interactive part of the whole is severely curtailed, but the package has to be considered as a whole rather than as a set of independent parts. Nevertheless it may be useful to consider first the performance, then the video production and finally the educative parts in isolation from each other. Last year I reviewed a recording of The Planets by this same orchestra under William Boughton on the Nimbus label. In that article I pointed out a considerable number of pitfalls that await the unwary, some of them of the composer’s own creation. One has to say that nearly all of these are avoided here, although I doubt that any performance could make Holst’s marked alternations between two and three beats to the bar in the central section of Mercury as audible as the composer clearly wished. Elsewhere problems of balance created by Holst are resolved by close microphone positioning (necessary for video purposes) and some clearly artificial boosting of individual players such as the euphonium in Mars. The only drawback to this is the very closely observed violin sound; the players themselves can withstand this level of intense scrutiny, but the harp harmonics at the end of Uranus are covered by the string pianissimo in a way that simply does not happen in live performances. 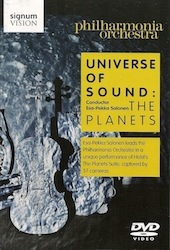 Otherwise Esa-Pekka Salonen, who clearly loves the work, gives a splendid reading with perhaps more fire than relaxation. The video presentation eschews any attempt at showing us the planets themselves - perhaps an odd omission for a project with which the Science Museum was involved, but then Holst was writing about the planets as astrological symbols and not astronomical bodies. What we get is a straightforward television presentation of the orchestra playing the score, but the vaunted use of 37 cameras means that we can get a much more detailed view of individual players than one gets in the usual concert broadcasts as seen on video and television. There is a price to be paid for this - in order for the cameras to be able to manoeuvre, there were consequent difficulties for the players in co-ordination which necessitated multiple takes and, as already observed, the resulting balance is somewhat artificial. This problem is exacerbated by the fact that the organ - spliced in afterwards from a completely different venue - is seen on screen, while the singers, similarly added after the event by multi-tracking, are never seen at all. This close observation of the orchestra by the cameras is inevitable given the educational and didactic purpose which the video also seeks to fulfil. One can also watch the performance with commentaries by the conductor - although I was unable to access this facility on any of the three players with which I tried - and members of the orchestra. The latter demonstrate particular problems in the score insofar as their own parts are concerned while also ranging quite widely over discussions concerning emotion in music and its effect on players. There’s also a delightfully diverting commentary concerning Mantovani of all people. These insights would be particularly valuable not only to newcomers to the score - who can also access spoken introductions to each movement - but also to professionals. I certainly discovered some aspects of the score of which I was previously unaware, and all composers should take note of the continual complaints of the players over unhelpfully placed page turns in orchestral parts. One point of controversy here: on several occasions the players remark upon the fact that they alter Holst’s written score in order to take advantage of improvements in technique and instruments since his day. I don’t imagine the composer would have objected to this. I had certainly never noticed the minor adjustments involved. That said, how does this square with the principle of ‘faithfulness to the composer’s intentions’ upon which we are always being lectured when Beethoven, for example, is involved? In order to extend this educational role to the process of composition, the orchestra commissioned a new piece by Joby Talbot to round off the suite. This is not a new idea. Colin Matthews produced a movement some years ago called Pluto, the renewer just in time for Pluto to be robbed of its planetary status. He made the unwise decision to splice this movement into the choral ‘fade’ which terminates the suite in its original form - and incidentally spoil one of Holst’s most novel innovations in the score. Here unfortunately Joby Talbot in his movement Worlds, stars, systems, infinity has made exactly the same miscalculation - the music for the final movement begins before Holst’s score has really ended. This means that listeners must perforce have this additional movement as well. Talbot has great fun with Holst’s massive orchestra, to which he adds further instruments (meditation bowls, a massive rack of crotales) and instrumental effects (timpani glissandos, stopped horns and various modern trumpets mutes) to conjure up a grandly impressive movement. Then again, it doesn’t really have much to do with Holst - despite some quotations from Holst’s textures which end the piece with its depiction of infinity. Also his use of the offstage chorus as a full element in the orchestral texture goes against Holst’s deliberate distancing of the singers from the orchestra. In an accompanying documentary we are told that patrons at the Science Museum were able to interact with the compositional process, transferring passages from one group of instruments to another to compare the effect. This was doubtless valuable in that context but for video presentation it might have been better to separate the Talbot movement off to a completely independent track. There are not many musical works that could stand up to this degree of close scrutiny, but fortunately Holst’s Planets is one of them. Ivan Hewett for the Daily Telegraph reviewed the original exhibition at the Science Museum, and observed that “For newcomers to the orchestra, this installation certainly gives a taste of its amazing richness. But it could be useful to music-students too, keen to get some tips on how to balance winds against brass.” I am sure he is right about this, not having seen the ‘installation’ myself - but I note from the Philharmonia’s website that they intend to tour the exhibition to Canterbury and Birmingham during 2013 before it is “developed for international touring”. I would certainly, on the basis of my experience of this DVD, make an effort to catch it.